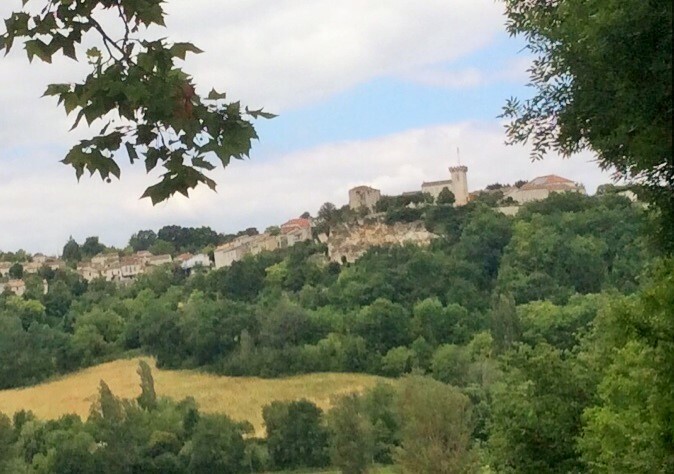 Roquecor is perched on a rocky outcrop overlooking the valley of the Petite Seoune surveying river and road traffic going between the Quercy (Lot) and the Agenais (Garonne). It is commonly claimed that Roquecor is a medieval village which started with the construction of the Chateau by the Aspremont family in the XII Century, but evidence is piling up that it was an active, occupied place from Pre-historic, Celtic (Gaulois), Roman, and Medieval times through to the present day. 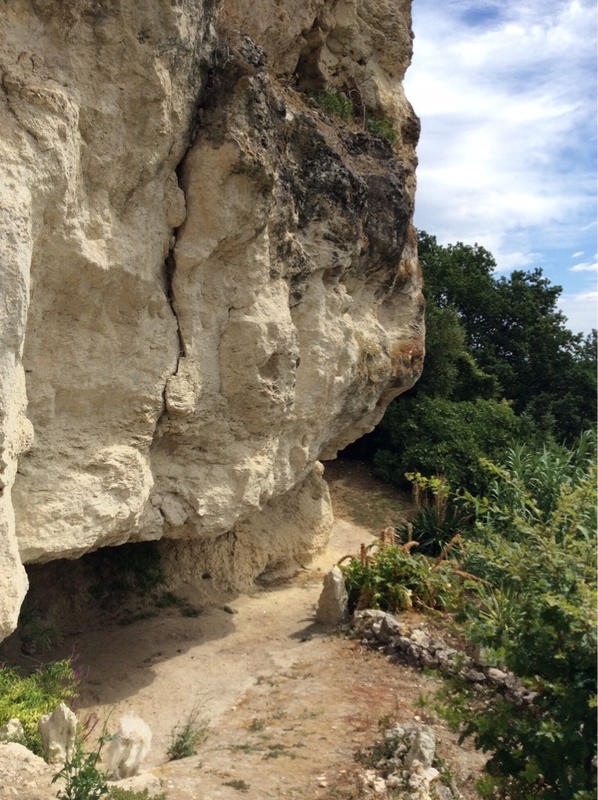 Troglodyte caves at Roquecor were identified by antiquarians in the mid 1800s. While these may have been re-used over many centuries, there are indications of early occupation. It is from these caves, and their overhangs that the village gets its name…Roqecorn, Ruppe Cornu or stone horn. The ‘horn’, also called ‘Lou Roc des Nobis’ is reputed to have crashed down on a wedding party during medieval times killing several people including the bride. The rock and the area from where it was detached are still visible down below the chateau. Studies of the names include Roque (from the Occitan Roca) which is the designation of a chateau constructed on the edge of a promontory and Cor (from the latin Cornu) which indicates pointed. Ferrussac, on the hill at the other side of the Petite Seoune River opposite Roquecor also boasts troglodyte caves (indeed antiquarians proposed a troglodyte ‘village’). Roman activity is widespread. The areas around Roquecor, including St Julien, Couyssels, and La Gardette are rich in Roman archaeology - as is Ferrussac. At St Julien in 1882 grey marble columns, a paved floor of hexagonal tiles, tegulae, and several internments indicated Roman burial practices. In the same area in 1974 during the preparation for a house build, more evidence of Roman life turned up in the form of partial stone capitals, animal bones, oyster shells (that snack food much loved by Romans) and tesserae from a mosaic floor. Ferrusac has the remains of a Roman villa. It is mostly buried by the church. Field walking on the valley paths east of Ferrusac turns up pottery fragments to this day. Discoveries goes on… In 2015, there are indications of a Roman villa which is yet to be explored on the valley floor below Roquecor towards Montaigu de Quercy, and evidence of another building not far from the 12th Century medieval church of St Martin. Pottery finds have also been found near an orchard on the road heading out of Roquecor towards the D656 junction opposite the Chateau de l’Hoste. Up on the high ground on the border with the Lot & Garonne, there is a strong hypothesis that La Gardette, which is just north of the D656 roundabout, was a Roman ‘mutationes’ or way station where horses could be changed. It is exactly one day’s ride from Agen. Recent field walking on the site has produced slag from metal working, a range of coarse and fine pottery (including samianware) and even some pieces of glass. Archives also indicate that finds have been discovered which cover a long historical period, proving constant usage from the Roman era right up to the present day. A farmer in the Petite Seoune Valley below Roquecor found amphora in a field which would have bordered the river before it changed its course. The Roman Road archaeology group members who talked with him blanched when he said he threw this pottery over his shoulder into the ditch to clear the field. 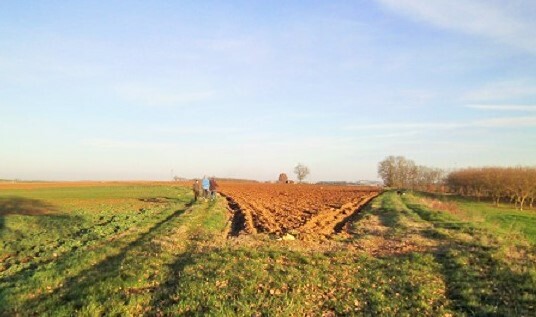 He found our horror very amusing and on investigation of the field evidence of Roman occupation of the site was found. His story suggests that the Petite Seoune may have been navigable and that goods were being transported for Roman use or that a Roman Road was nearby. Both these ideas are possible. Evidence is being sought to prove that a Roman Road follows the river valley all the way to the Garonne valley, which would have passed below Beauville, Cauzac Le Vieux (where a Roman villa was discovered when work was done in the cemetery), Naudou Chateau and Mill near La Sauvetat de Saveres (with Roman mosaics found indicating a Roman villa), and the famous Roman site at Castelculier. The raison d’etre for Roquecor’s Roman past, was probably the proximity of an important road nearby. The Roman Road Archaeology Group has identified the Agen/Cahors road called the Camino de Na Bruniquel which passes close to Roquecor. It snakes loosely along the modern D656 and there is a fork in this road which leads to the Roquecor area. The names of fields with a topography describing antique roads and sites, and clear double boundaries (indicating a trackway) show up in the Napoleonic maps of the early 1800s. Walkers can still follow parts of the road as it wanders through fields and past orchards. A large number of these Roman sitesappear to have been destroyed towards the end of the Third Century A.D, when the Samartians and Alans, who had swept down past Perigeux and destroyed it, moved into this area and ravaged the Roman economybefore heading south to Spain. Many of the villas and workshops were never re-built, though with a rise in prosperity in the Fourth Century several large villas were constructed with rich mosaics and bathhouses (Castelculier, Seviac and Fauroux). If you look carefully in old stone villages, hamlets and farms, you can find old houses with very neat little dressed stones in their walls, looking more like square bricks than rough field stone. These houses are probably built from stone salvaged from those destroyed Roman villas. History re-cycled. What is touching about history is how it repeats itself. The site of the new roundabout, where the modern D656 crosses the D47 Montaigu de Quercy to Valeillesroad, replaces what we believe to be a major Roman road ‘Carrefour’ only 50 meters away.